STAMFORD, Conn., June 6, 2018 /PRNewswire/ -- Information Services Group (ISG) (Nasdaq: III), a leading global technology research and advisory firm, today issued its first-ever global market view of service provider capabilities as part of its ISG Provider Lens™ Infrastructure and Data Center/Private Cloud Quadrant Report. In its latest ISG Provider Lens report, ISG evaluates 40 service providers that offer infrastructure sourcing services, including 26 that offer managed and transformation services globally. ISG also evaluates in separate quadrants providers that serve the U.S. market with managed and transformation services, managed hosting services and colocation services. Previous reports covered the U.S. and German markets only. ISG plans to expand its coverage to other markets going forward. The ISG Provider Lens™ Infrastructure and Data Center/Private Cloud Quadrant Report found enterprise buyers of infrastructure sourcing services are taking an application-centric view of their infrastructure operations. This leads them to adopt hybrid models that distribute their application portfolios across traditional environments, on-premises private clouds, hosted private clouds, colocation facilities and the public cloud. Providers, in turn, are adapting their services to offer comprehensive visibility into their customers' hybrid infrastructure. "The way enterprises source infrastructure services has evolved over the last few years," said Esteban Herrera, partner and global leader of ISG Research. "With the rise of on-demand and elastic infrastructure models, enterprises now expect a similar experience within their organizations. As businesses increasingly become digital and software- and data-driven, they need an infrastructure that is adaptive to changing market conditions, can be easily managed and is always available. " To lower costs and improve efficiency, the report found managed services providers are moving toward industrialized service delivery models that leverage repeatable and scalable processes and employ automation. Infrastructure services now typically include automation tools developed in house or from third parties as part of the provider's branded offering. Forward-looking providers also are developing expertise in software-defined technologies to support such DevOps practices as continuous integration and continuous delivery (CI/CD) that speed time-to-market, particularly for client-facing, web-based applications. Some of the larger service providers are differentiating themselves through proprietary solutions and technology vendor certifications. Eight of the 26 global managed and transformation services providers profiled in the ISG Provider Lens report were named market leaders: Accenture, Atos, Capgemini, DXC, HCL, IBM, TCS and Wipro (see figure). The ISG Provider Lens report also examined the U.S. managed hosting market, which is evolving to provide a more cloud-like experience with self-service environments and shorter contract terms. Some providers are expanding beyond the operating system layer to provide managed services support for enterprise applications such as ERP packages, the report noted. ISG named DXC, IBM, NTT Communications, NTT DATA and Rackspace as leaders in this market. Colocation providers, meanwhile, are increasingly becoming the key connection point for their customers' hybrid IT environments, ISG found. Most have advanced their interconnection services to provide direct, low-latency links to the major hyperscale public cloud providers. The colocation market has consolidated recently, with the top four or five players commanding a significant share of the overall market. ISG named CoreSite Realty, CyrusOne, Cyxtera, Digital Realty and Equinix as U.S. market leaders in this space. 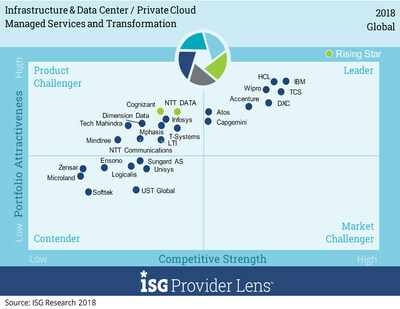 The ISG Provider Lens™ Infrastructure and Data Center/Private Cloud Quadrant Report is available to ISG Insights™ subscribers or for immediate, one-time purchase on this webpage.